Call (877) 252-2229 to Order! For those who are struggling to find the perfect new and unique gift for their loved onethis is it! Baby Bouncy is a unique gift and will be a favorite with any new mom! In becoming new parents you truly realize what the term tired means. At times you will do anything to help get your crying baby to sleep or calm down. We noticed that our new baby would only go to sleep if she was being both held and bounced. This made sense to us because of the similar motion that our baby experienced in the womb or while riding in a car. Shortly after our first child, Baby Bouncy was born. We realized the need for new parents to be able to calm and relax their babies and thus created Baby Bouncy, Inc.
To make a long story short, we started BabyBouncy.com on Labor Day (fitting) of 2004. Our goal is to deliver fantastic, innovative, and safe baby products to new parents. 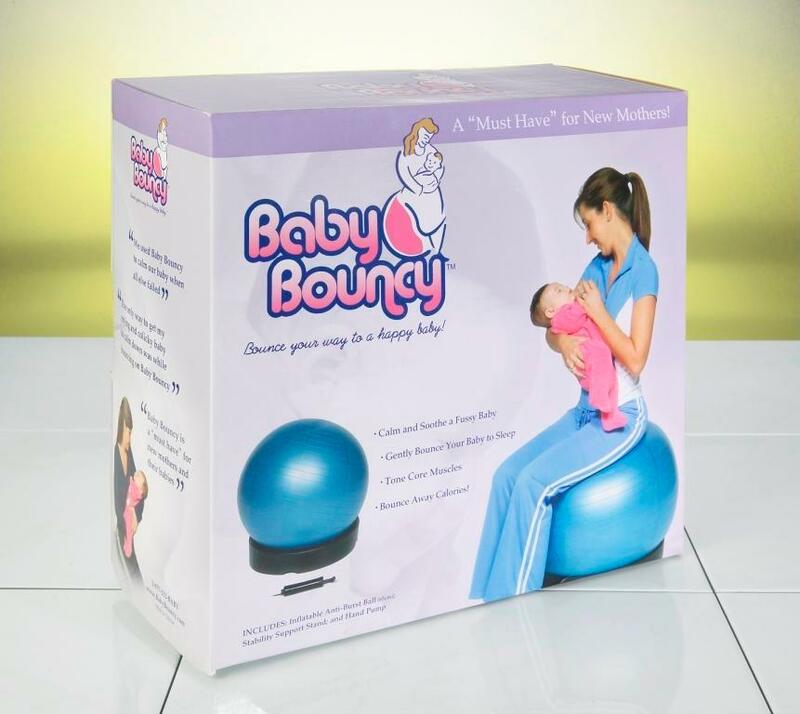 Baby Bouncy consists of an inflatable anti-burst ball, stability stand, and pump. We are very excited about Baby Bouncy, and its ability to solve a huge problem so easily. So, please drop us an email or send us a note to tell us about your experience. We love to hear from our customers! Be sure to visit our testimonials page to see what people are saying about Baby Bouncy. Download our product information pdf here. Download our additional product information pamphlet pdf here.